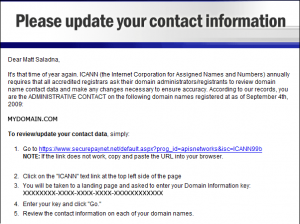 Every year around October/November our domain registrar sends an e-mail asking users to verify their contact information. 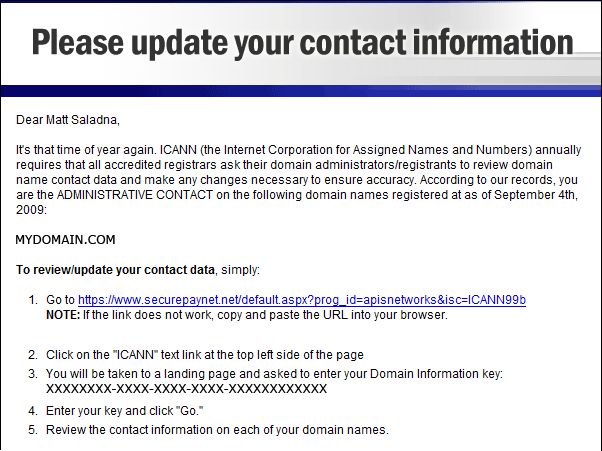 The subject line is, “Important Notice Regarding Your Domain Name(s)” with a secure link to www.securepaynet.net. Just take a few moments to follow the link to www.securepaynet.net and verify the contact information by the special ICANN button. Verification is not mandatory; however, strongly encouraged to make sure the e-mail address associated with the domain is current.